ZTE might be onto something with its next smartphone, which is said to launch on October 17th. Codenamed Axon Multy, this ZTE smartphone is all set to redefine the smartphone era with its foldable dual-screen device. Bendable display phones have been talked about for years, even made it to concepts like Samsung Galaxy X. So far no brand has gone ahead with an official announcement. But ZTE is taking a step further and getting ready to release world’s first foldable smartphone. Well, how about that, huh! 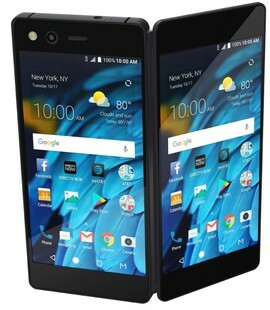 Let’s find out about ZTE Axon M specifications and price to know more. If ZTE is planning to sell this handset to high-end users who’d like to shell out money for such innovative stuff, then, they must provide a flagship chipset. Cuz high price point demands for high-quality performance, thus, a high-end chipset to fulfill the demand. Probably a Qualcomm Snapdragon 835 processor is used on this unique smartphone from ZTE. Expect a 4GB or either 6GB RAM to support multitasking. A dual rear camera would be the best choice, even if it's a dual 12MP setup, it should be fine. But who knows what has ZTE got in store for its users. It would be interesting to see how ZTE places the rear sensor since this would be a foldable display smartphone. Would camera sensor be revealed once the display is folded out, or will it be embedded elsewhere? The choice company makes would decide the usability of the camera on Axon M.
This smartphone would definitely require a large battery capacity to power since there are two displays that need to be powered. But smartphone brands tend to think they can do magical things like providing good battery life even at a small battery capacity. ZTE have to think practical here that how much battery capacity would be required by the device to power it at least a day. Doing that they have to be careful about the placement and design of the battery compartment, for obvious technical reasons. Axon M tries to bridge the gap between smartphones and tablets with this foldable display technology-enabled device. Two displays could truly mean that ZTE Axon M might be running two apps at same time, unlike today’s large screen devices in split mode. This design could revolutionize the mobility and give birth to a new generation of smartphones. Reportedly, the Axon M once folded out would reveal a 6.8-inch display. Despite dual screen, it would be relatively sporting a sleek profile. This should not be an issue on a smartphone, we are living in 2017. The days were gone when you’d have to either struggle with low storage or pay a hefty amount for extra storage. Times have changed, storage is cheap! First modularity, then, bendable display and now comes in a foldable phone. Brands are always hungry for innovation, and these crazy ideas help them achieve that innovation. Only the time will tell whether a ZTE Axon M device would be picked up by users or not, but one thing is sure that other brands would follow and jump the bandwagon if that happens. ZTE Axon M full specs and reviews as of Apr 2019. Buy it here! Sensors Integrated Power Button and Fingerprint Sensor.